Terry Francona, apparently, is a Starbucks guy. 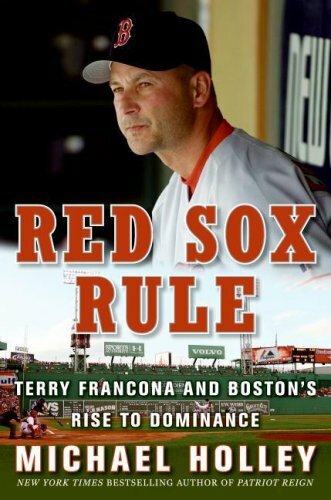 Now in his sixth year managing the Boston Red Sox, Francona has managed the team that went 86 years without a World Series championship to two titles. Boston fans have mellowed a tiny bit since the title drought ended in 2004, but it’s still a potentially brutal place for a manager. He was going to need a similar pep talk on this Saturday morning, working on two hours’ sleep. He left the house, drove to Starbucks for the usual, egg salad sandwich and a large coffee — and headed to Fenway. But before he gets to that point, there are the 7 a.m. wakeups that often represent the only time he’ll see his two younger kids all day. The morning ritual at Starbucks, where he sleepwalks past the occasional autograph seekers to his tall coffee and egg salad sandwich. The matchups and reports that wait on his desk, where he left them the night before. The calls from players, detailing this injury or that problem. The trainers visits that don’t always bring good news. Holley describes it as a “large” coffee, Benjamin says it’s “tall.” At Starbucks, that could mean any of three different sizes. Can we assume that’s a venti he drinks every day? I like to think so, at least — and if Francona refuses to order it in StarbuckSpeak, all the more power to him. In any event, I love this image of Francona stopping at a Starbucks each day, and adhering to a cherished daily coffee routine. (Major League Baseball managers — they’re just like us!) Part of the appeal is that Francona is the near-opposite of a Starbucks-addict stereotype. He’s laid-back and self-effacing, and when Boston fans panic (which is often), Francona is an even-keel foil to all the regional anxiety. Coffee shouldn’t only be a means of keeping wired — drinking coffee that you really enjoy is a perfect and inspiring backdrop to the beginning of a work-day. From late February until October (hopefully until late October), that’s the way Francona is gearing up for game day. Like MAS, my INeedCoffee colleague, Francona is big on drinking tea as well as coffee. He is a spokesman for Bigelow Tea and starts each game by drinking a green tea with pomegranate.